The sting is in the tail and has always been. But for the women and children of the Jaffna peninsula it is a different tail that stings them.Hiding in dark and dingy corners both within and without homes, out come these creatures from under cupboards or furniture, mounds of leaves, stacks of firewood or logs, to deliver their deadly poison. They have even been found among clothes. It is the vicious Red Scorpion that has left in the wake of its envenoming, not only severe illness but also death.The Red Scorpion which inhabits neighbour India has not been spotted in Sri Lanka till the new millennium (starting in 2000), points out Professor in Medicine of the Peradeniya Medical Faculty, Prof. S.A.M. Kularatne, questioning how it has come to make the Jaffna peninsula its home. Did this intruder surreptitiously scuttle in with the men and their stuff which landed on the northern shores even before the ink had dried on the 1987 Indo-Sri Lanka Agreement signed by then Sri Lankan President J.R. Jayewardene and then Indian Prime Minister Rajiv Gandhi? Is the Red Scorpion an unseen and unwelcome migrant with the Indian Peace Keeping Force (IPKF)? This is what Prof. Kularatne and his team are pondering over having published just last week their findings on the new scorpion species in Sri Lanka in the online research publication ‘Euscorpius – Occasonal Publications in Scorpiology’ (http://www.science.marshall.edu/fet/euscorpius/) generated from Marshall University in Huntington, America. 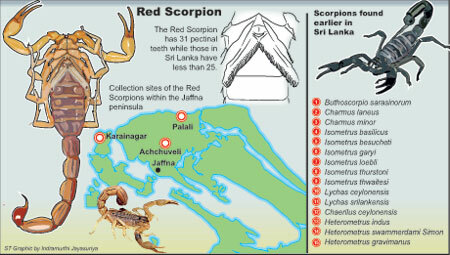 “A scorpion species proved to be lethal to humans was recently recorded from the Jaffna peninsula. This species is morphologically different from all other known scorpions in Sri Lanka. The species was identified as Hottentotta tamulus (Scorpiones: Buthidae) which is commonly found in Maharashtra, India,” says the study. The tale that Sri Lanka’s 15 scorpion species have now become 16 goes back to 2008 when Prof. Kularatne took wing to Cochin, India for a snake-bite seminar. Meeting a well-known Indian scorpion specialist, Dr. H.S. Bawaskar a discussion had ensued that unlike in India, Sri Lanka did not have “deadly” issues with its scorpions, as we “didn’t have the Red Scorpion”. To Prof. Kularatne’s dismay, when he visited Jaffna in 2008 to conduct a snake-bite study with Dr. Sivansuthan he had been told that there were not only a lot of scorpion-stings but tragically there were also deaths, unlike before. Dr. Sivansuthan as a medical student and young doctor had not seen this type of scorpion sting. It is the largest Red Scorpion that Dr. Nandana P. Dinamithra has seen. A five-year-old boy had been playing on his bed around 7.30 p.m. before drifting off to sleep on March 4 (last Monday) when his parents heard screams. Rushing to his side, they had found him writhing in pain, with an angry red sting mark over the lower back (lumbar spine). He had been admitted to the hospital close to his home with vomiting, while what he was throwing up was bloodstained. His limbs had been cold, his pulse racing and his blood pressure unrecordable. Treated there, he had later been transferred to the Jaffna Teaching Hospital where his condition had begun to deteriorate, with signs of pulmonary oedema (caused by excess fluid in the lungs) and severely low oxygen saturation. Administering oral Prazosin, the child had been transferred to the ICU, with hope of survival coming four hours after, says Dr. Dinamithra. Although this is the “worst” envenomation Dr. Dinamithra has seen in the past 14 months, the child has recovered and already gone back home. However, there was a surprise for Dr. Dinamithra-the mother scorpion had given birth to 50 babies. Keeping them on her back, she had begun to eat them up. Meanwhile others with scorpion stings have not been so lucky. 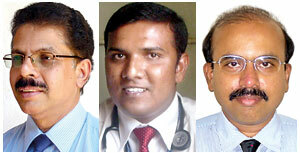 Twelve deaths of children due to scorpion envenomation had been recorded at the Jaffna Hospital in 2003; and one death each in 2006, 2007 and 2009 respectively. From January 2012 to February 2013 (this year) 80 cases of scorpion stings have been reported of which 52% were females and 48% males. Of the 80 treated cases, 30% were children between 3-12 years of age, the Sunday Times learns.About four patients are admitted to the Jaffna Hospital every week with scorpion stings, it is understood. The victims who had not been able to catch the creature would come with the story of “white scorpions” stinging them, explains Prof. Kularatne, pointing out that the young Red Scorpions were pale coloured and the people were used to seeing our common scorpions which were black. It was in 2010, that Dr. Sivansuthan began collecting the scorpions, both dead and alive, brought in by the victims, with Dr. Dinamithra who went for training to Jaffna Hospital being entrusted with carrying out the study. Prof. Ranawana helped us identify the Red Scorpion and it was to Mr. Kovarik of Czechoslovakia that one dead specimen was sent with the permission of the Department of Wildlife Conservation to get confirmation from a world authority that it was indeed the Indian species. “We assume that the Red Scorpion which may have had an illegal trip to the north with the IPKF (the first troops landed on July 31, 1987, more than 25 years ago) would have gradually multiplied to become a menace to the people of the Jaffna peninsula,” says Prof. Kularatne. Interestingly, a large number of patients come from Palali and Achchuveli, where the IPKF had camps, he says.�It is a “vicious fellow”, he adds, moving with speed, like a tractor. The black scorpions of Sri Lanka do not move so fast. The need of the hour now is to ward off the “high risk” of the Red Scorpion infiltrating other parts of the country, with goods and sand being brought from those areas, cautions Prof. Kularatne.